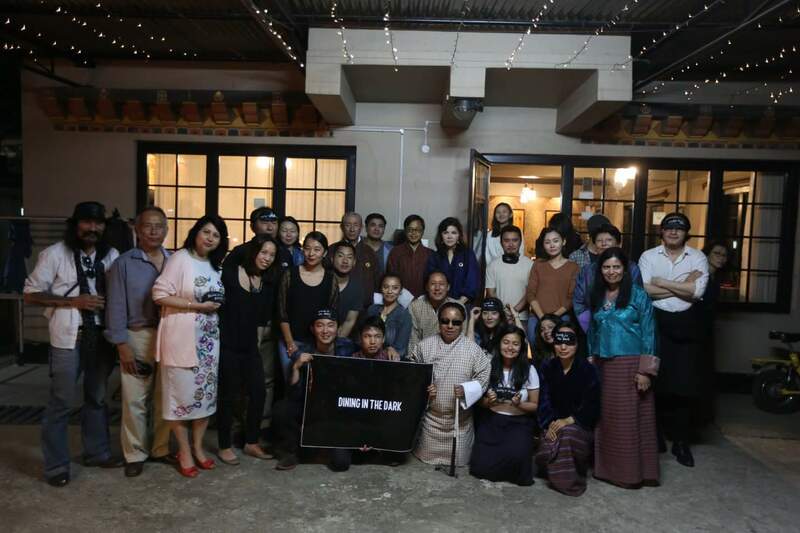 While rest of the people in Thimphu city were busy settling down for the night on 6th June 2018, a group of special guests had gathered at Chh'a Bistro and Bar at Changzamtog to experience what was going to become one of the greatest adventures of their life. They had come to have ordinary dinner in an extraordinary environment. As they walked in through the door, they were blindfolded and escorted to their tables by volunteers. With their door to the world of light shut, they were left on their own to figure out how to make better use of their remaining four senses to perceive what was going on around them. For those who had never been in such an environment before, it was one of the most challenging moments of their life. Soon, the soup and other foods came on the table and not being able to see what was in front of them, they struggled even more as they groped for their foods. Some of them even had to eat with their hands as they could not use their spoons and forks. At the end of the ordeal, all the guests felt relieved that they have somehow managed to dine in the dark although some of the food items that were served were left untouched. Dining in the Dark has now become an annual event after Kinley Phuntsho, a 25-year-old visually impaired artist and his friends initiated it last year as a platform to create awareness on the needs and rights of persons with visual impairment. It creates an environment for sighted people to experience life and see the world through the lens of a visually impaired person. Although a few hours of darkness cannot represent the entire life experiences of persons with visual impairment, it gives people the chance to at least have a glimpse of how it feels like to be blind. The organizers hope that this experience would go a long way in creating an inclusive society where persons with disabilities can enjoy a life of equal dignity and respect. Therefore, each guest has a responsibility to take the message far and wide to break the social barriers that have pushed persons with disabilities to the edge of the society. Santabir Rai, a visually impaired civil servant who was also at the dinner said that the interaction was very interesting and worth cherishing. He shared that one of the funniest things he noticed was that as soon as the sighted people were blindfolded, they began to talk at the top of their voice even with those who were nearest to them. Having been blind for over 40 years, he was perhaps the only guest at the gathering who actually enjoyed the dinner. All the rest were utterly disoriented and had no idea what they were even eating. Tshering Tenzin who works at Kuzoo FM also said that although he is a low-vision, he could not eat with a spoon after being blindfolded. However, he was not the only one who was disoriented. Another guest, Jurmi Chhowing who is a writer has also shared similar experiences on his Facebook timeline on the following day. “When the dining concluded we were asked to take off our blindfolds. A part of me wanted to keep them on but I’d to take it off and when I did I saw that I hadn’t even touched the French Fries. And that the table I was seated at was one long big table” his post reads. Despite all the challenges and discomfort the experiment caused, the guests could certainly discover some new insights into the lives of persons with visual impairment and that changed their attitude towards disability. “I think their lives are not as limiting as we’d like to think because we’re judging them from an experience we haven’t had” Jurmi Chhowing writes. He also shared that after he was blindfolded, he realized that his other senses seemed to sharpen significantly as he found himself engaging with people with greater concentration. The experiment left everyone with a new experience to take forward. Guided by the slogan “Eat good, do good and pay us as you wish”, the event was also aimed at raising funds for persons with visual impairment in Bhutan. I was panning to be there as well. But some last minute thing came up. I really wanted to experience the unique dinning event to understand the world without light, and more to connect with myself...to find the part of me that’s hidden by the light. Really appreciate those people who have come up with this special dinner idea.